AsuDev was an artist of solitude and nature. He found his free self were the canopy of the sky borders on the horizontal line, where the cataracts reverberate the tranquility of the solitude, where the stratus of the wood raise its mellifluous chorus with the blowing of wind; and all these reaction of his sincere artistic mind came out in bold-relief vibrant with life on his canvas. His paintings speak volume of his robust attitude towards life and no classical fetish idea could overwhelm his set idea about life. While the world of Indian artists is taken by storm of so many revolutionary ideas about life AsuDev secluded himself in the placidity of solitude and in apron string of sylvan love far from the rat race of modernity. He painted the guileless life of simple man and women in the lap of nature by drizzling dot- a medium exclusively of his own. Banality and the inscrutability of modern world of art could not attract him much and this was because of his sympathetic acquaintance with and feeling for common men and women in drudgery of life. Common men and women find themselves in lively relief on his canvas. In the world of art AsuDev was independent with his own technique bearing no signature of any hierarchy and tradition. He stood out as a sole revolutionary in his own way Independent of any criticism. He was not guided by any school of thought; he was guided by his own spontaneous urge and as such the technical aspects of his paintings sometimes suffered the call owed-ness of un-education in the eyes of educated exponents. He was saturated with the natural environment of this far eastern region where he was brought up and breathed his last. He roamed up and down this region criss-crossed with red river and rivulets and blue hills. In the stubby robust tribal demoiselles he found the conglomeration of natural beauty of high-land. He was saturated in their guileless love. He found them on his canvas vibrant with the cadence of Bihu-dance and song or in natural rhythmic posture of fishing. Undulate hills provided him with the life model for his blunt and lumpish nudes corresponding to Indian temple sculptures. He was always of the opinion that every creation was a collection of dots and he sincerely took this idiom as his own technique and anthropomorphism in his art found a lively expression through the medium of dots with tempera effect of calm and soft tone on his canvas. His outlines were well trimmed but without any sharp and distinct demarcating bordering line which created an illusion on the retina. He painted full-canvas; he left no blank space for outer border-frame as he believed in the boundlessness of nature’s canvas. He completely identified himself with the world of his own philosophy, theme and with the idiom and attitude towards life. Drift of his mind cannot be gauged by the urban norms. Drudgery of middle class life never piqued his mind with the modern disease of intellectual alienation. He brushed aside his own suffering self and he perfectly assumed a lambian attitude towards life. His theme never suffered the plague of propensity or instinct. He sought Absolute bliss in nature and its inmates and humbleness in life. His win some personality drew around him nucleus of admirers- average and savants. He was good table talker with his ever- green mind. His interest in various disciplines made him attractive towards the younger particularly. While he talked his inmost green mind came out encouraging the listeners of any group. AsuDev is dead but ‘Asuda’ is alive in chiaroscuro of Nature reverberated with the natural music of ‘Bihu’ mellifluent voice of tribal damosels, dancing rivulets and humble rural life of Eastern Region of India. Asuda with all his jovial qualities will be ever living to the younger groups either, and he will be ever conspicuous by his absence from amongst them. 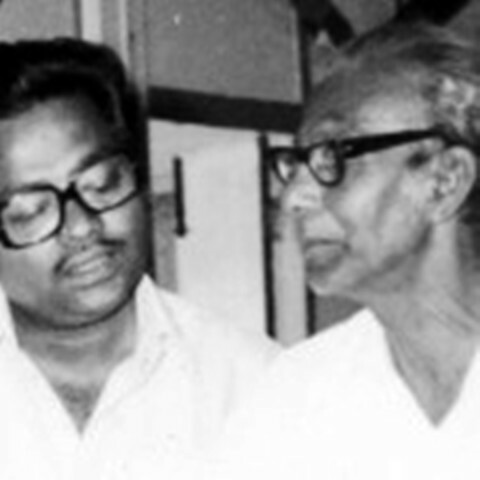 SUBROTO GHOSH: Was a close friend of the artist. He had deeply observed the artistic work of the artist from close quarters during the later years of the artist.